This is article four from John Royer, a man living as humorously as possible with PSP. I thank the physical therapist that I have, namely Ryan Macalintal of the GOOD SHEPHARD REHABILITATION HOSPITAL in Allentown, Pennsylvania. Without Ryan and his organization, I would not be able to do the things that I am going to talk about. As I said in my first article, I started physical therapy. When it ended I joined the gym. This is not like a regular gym because you still have an occupational therapist walking around and answering questions. After a one hour orientation, you are free to exercise on your own and can ask questions now and then as needed. It is an interesting place but at first it is depressing because you see all types of people in wheelchairs. The wheelchairs vary from pushed to electric motive drive. I immediately noticed something extraordinary about the people in wheelchairs. Instead of being depressed, they are very upbeat and easy to talk to. Knowing that I will eventually end up in a powered wheelchair, I was full of questions. All of the people that I met answered willingly and with enthusiasm. The most expensive wheelchair that I came across was $30,000 with 80% of it being paid by Medicare. This chair could do anything including recline so the person could take a short nap. I wondered if it could scratch your back as well. Their ailments were mostly caused by accidents, usually by vehicle. I did meet one gentleman who had fallen out of a tree stand while deer hunting many years ago. Some had disability of muscular function. One young woman looked like Stephen Hawking in her chair. They would have gotten along famously if they had met. She always had a smile and I could not fathom how she could have such a sunny disposition coupled with a sense of humor. She had a pad that she used with great difficulty to produce voice messages. I was amazed at the human spirit in action in these severely handicapped people. I felt like a sourpuss by comparison. 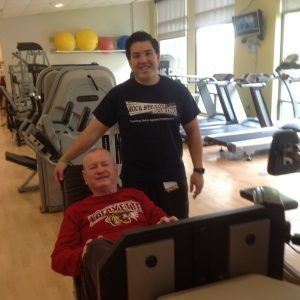 You may wonder how a neurological disease like PSP can be helped by exercise (I use something called a leg press). Part of the problem with PSP is the signals that the brain sends to the muscles and the other is the degeneration of leg muscles due to inactivity. Using a leg press machine is helpful because I am doing an exercise while reclining in a seat and holding onto two metal arms to prevent my falling sideways. This allows me to easily press against a plate and raise the weights at the side of the machine. I started at a reasonably low weight and over many months have progressed to doing 410 pounds for a total of 30 repetitions twice. How does this help me, specifically? Besides getting a big head? Since the unconscious ability to control balance starts as a baby, I had to relearn the ability without the unconscious control that a baby has. I had to think about controlling my legs consciously. I could feel when I was beginning to fall and think on a conscious level to control my balance. This may sound like a lot of humbug but it is not. I have to think about every step and about my spatial orientation. Does this prevent every fall? No! But it’s a lot less and my falls are more graceful. I still walk like Frankenstein’s monster and look as silly as he did in the movie. Perfection is unattainable. At least for me. Wow, I made a new word. My wife drives me to the gym a few times a week and I concentrate on the leg press machine. This is called resistance training, not weightlifting. You sit, not stand. It is necessary to have strength in order to correct the atrophying of muscles due to lack of activity. I need strength to correct my gait and I need strength to stand up, bend, or sit down. At one time, I could do none without a lot of assistance from my family. Now I can do it on my own. With chairs or the bed I have to be careful. I have to lean forward with arms forward in order to put my center of gravity away from my body and in front of me. Otherwise, I fall back. Therefore, there are three items that must be addressed in order to be mobile, conscious control of motor movements of the legs rather than unconscious, strength, and moving one’s center of gravity forward when rising or sitting down. The early morning puts a kink in all of this. I sit up and I’m dizzy. My muscles are greatly weakened and my gait is terrible. As the day progresses I can do better until I am walking quite well by afternoon’s arrival. I have no explanation for this. It is most irritating not to have answers. Another change in activity is my newfound ability to bend and pick something up. I usually squat rather than bend over and my strength allows me to stand up. If I bend over to pick something up I have to hold onto something solid because my center of gravity is off. But I have learned to adjust to this as well in order to avoid using a handicap clamp device. These are all important achievements to someone with PSP. I do not feel as helpless as I was before. But none of this could have been achieved without going to a gym and using the equipment, specifically the leg press machine. So says my wife, Mary, my proof reader. Minor tweaks and it’s done. Whatever happened to the woman from 1968? I could do no wrong. Now my gorgeous wife is my biggest critic. Oh, for a time machine!